This morning I saw an old man shuffling at a painfully slow pace, his legs moving like a wind-up toy with diarrhea in its pants. That has to be the worst part of growing old; decades of perfecting a dignified gate reduced to a manic diarrhea shuffle. I picked up Paul Pope’s Battling Boy shortly before leaving for Dublin, so at the moment it’s pretty much the only comic I’ve had on me. That gave me plenty of toilet time to pore over every page, and it’s pretty damn great. In typical Pope fashion the art is very alive, something that even the little details—like his fantastic lettering and cascading sound effects—help drive home. 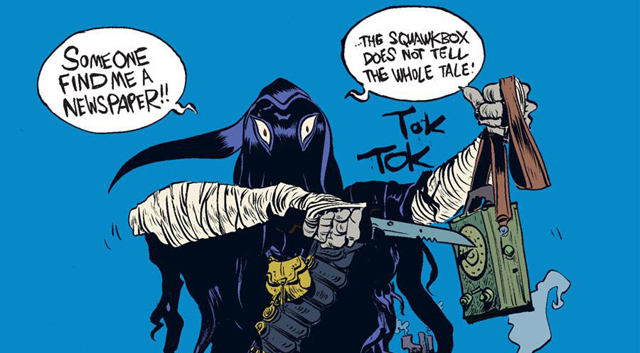 Battling Boy‘s story is as simple as its title. A sprawling city called Arcopolis has long been under siege by a variety of monsters, forcing a nightly curfew to keep the kiddos safe, and ensuring that the city’s tank battalion is consistently hard at work. Things are somewhat manageable thanks to a rocket-propelled hero, Haggard West, but once he bites it there’s little left to protect the citizens from all the marauding nasties. A lucky break comes shortly after his death, as a god prepares to send his son to Earth to complete a rite of passage. Enter: Battling Boy, who aims to help rid the city of its cancerous, creature-filled tumor. He won’t be alone, though, as Haggard West’s daughter, Aurora, spends the meat of the volume gearing up to step in her father’s shoes and exact vengeance upon the ghouls who took his life. The rest of the comic follows Battling Boy as he acclimates to his new surroundings on Earth and gets ready to fight off the monster menace with his suitcase full of power-granting t-shirts. If ever there were a comic with a central conceit handmade for marketing, this is it. 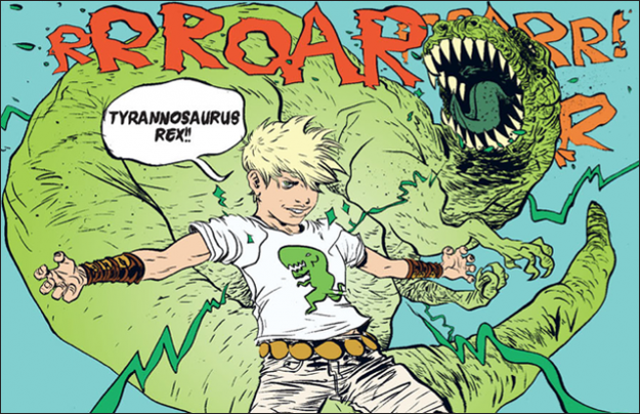 One can easily imagine an alternate universe in which Battling Boy is a Saturday morning sensation and little kids are running around with shirts sporting Elephant, T-Rex, and Gryphon designs. But they’re not cynical marketing fodder—though that could change judging from Battling Boy‘s Hollywood history—they’re just cool items that add some nice flare to the pint-sized hero’s own unique means of fighting. Battling Boy isn’t some overwhelming invincible force; he shoots, skids, and flails through most of his fights, and that’s what makes them fun. Pope has a knack for creating a sense of geography in his action scenes, giving Battling Boy a heightened sense of urgency. The monster designs are fantastic, too. The hulking, car-crunching Humbaba takes up most of the spotlight, but I’m pretty happy whenever something has a “monsters in a bar” scene or two. Pope delivers in that regard, with a bunch of disgusting creatures smoking and clanging drinks together and raising a ruckus in their weird seedy section of the city’s underbelly. I didn’t really know much about Battling Boy when I picked it up, but I did know it looked right up my alley, and I’m usually right about that. Since I went in relatively blind, I was dreading the whole thing ending as I got closer to the final page, but it turns out it’s been split into two volumes. Of course, I suspected as much when the story came to an abrupt stop, but it’s comforting to know there’s more Battling Boy to look forward to, because it’s really something special. The best part is it’s completely suitable for any age. Anyone can appreciate its fresh spin on classic superhero mythology and what it has to say about the genre, but at its core it can also be read as a simple story of a kid beating up monsters. I’d buy a book just called A Kid Beating Up Monsters, so I’m pretty sure Pope knows what he’s doing. Pingback: FEATURE: Crunchyroll News’ 2013 Favorites, Part Three – Movies, TV, Comics, and Everything Else! | We, The Otaku: Daily News!